We specialize in the manufacturing and exporting of an ample range of superlative quality Metallic Flywheel. Dynamically, statically and mechanically balanced, these are widely considered in the market. Known for taking maximum possible energy fluctuation, the offered products are highly acclaimed among the client-base we have reaped so far. Weight: up to 20 M.T. 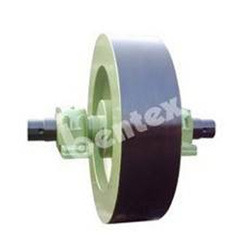 An ISO 9001:2008 certified company, Bentex Industrials Private Limited, established in the year 1996, is among the prominent manufacturer, supplier, trader, exporter & service provider of Hot & Cold Steel Rolling Mill Plant, Machinery & Accessories. Our effective product range is inclusive of various types of hot & Cold Steel Rolling Mill, Wire Rod Rolling Mill, TMT Rolling Mills, Structure rolling Mill Etc. These products are precisely engineered from fine grade metal and alloy, which are procured from highly trusted, certified and reliable vendors. These products are known for their optimum performance, low maintenance, dimensional accuracy, sturdy construction and user-friendly operation. Furthermore, our company is engaged in offering excellent casting and forging services. To efficiently executive these services, we have appointed a team of highly experienced engineers and technicians. Owing to a sophisticated infrastructure facility, we have been able to manufacture and supply a wide range of products within the stipulated time frame. We have segregated our infrastructure facility into different units to ensure streamlined operations. Based on the prevailing trends of the market, our infrastructure is upgraded with the sophisticated machinery. To effectively handle the machinery installed in our infrastructure facility, we have appointed a team of highly skilled and experienced professionals. We export our product in all over the world.